The definitive list of Football Manager 2019 wonderkids featuring personal recommendation ratings, color-coded potential ability classes, positional navigation and advanced live search. Fully updated for 19.3. Welcome to the complete list of Football Manager 2019 wonderkids by FMSCOUT.com. This will, as always, be the most informed and comprehensive list of Football Manager 2019 wonderkids you will ever find. 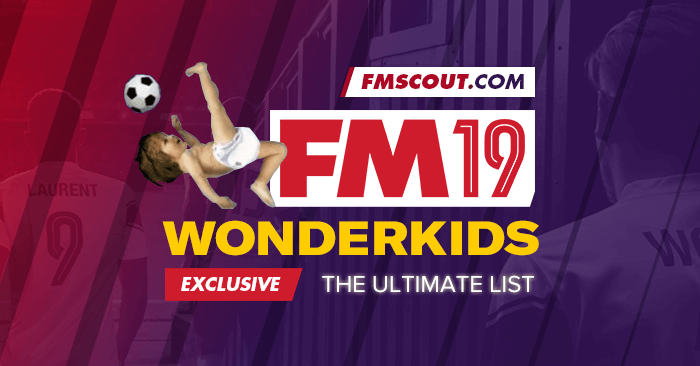 Football Manager enthusiasts trust this list to discover all FM 2019 wonderkids. Aproximately 750 FM2019 wonderkids included. This is the successor of our world-renowned list of FM 2018 wonderkids. Wonderkids can be classified players with high potential ability (having at least a PA of 150) who are not older than 20 years old by July 1st, 2018, in-game. This list features the best young players in FM19. Some of them will already be labelled as wonderkids, others should be pretty close to getting there, and others will struggle to live up to their potential before they turn 21 years old (late bloomers). Most players have PA of -8 which means they won't always have 150+ in your savegame. There are players with PA of -85, -9, -95 or fixed at 150+ (guaranteed wonderkid potential), and some others with PA fixed slightly below 150 who have impressive quality. There are no PA -10 players in the FM19 database. I have opted to use 5 classes of wonderkids this time, color-marked for your convenience. You can filter players by any data you like from all tables below, such as ratings, names, nations, clubs and wages. Start typing and matching results will be shown in real-time. For example, typing "England" will show you all English wonderkids. Added with Revision 1 (October 18th). Updated with Revision 2 (March 5th). Added with Revision 1 (October 18th). Updated with Revision 3 (March 13th). Added with Revision 1 (October 18th). Updated with Revision 4 (March 14th). Added with Revision 1 (October 18th). Updated with Revision 5 (March 16th). Added with Revision 1 (October 18th). Updated with Revision 6 (March 18th). Added with Revision 1 (October 18th). Updated with Revision 7 (March 26th). Added with Revision 1 (October 18th). Updated with Revision 8 (March 28th). Added with Revision 1 (October 18th). Updated with Revision 9 (March 29th). Added with Revision 1 (October 18th). Updated with Revision 10 (March 30th). I loaded all players (350k+) in-game to produce this list of FM19 wonderkids. Your savegame probably has less players loaded. How do you create this list? As we didn't have access to the pre-game editor until Nov 2nd, I created multiple savegames and used our in-house editor FMSE19 to filter all players that match the criteria of being or becoming Football Manager 2019 wonderkids. I keep the players attributes unmasked in my saves and holiday a few seasons to check on their development. Then I assess every player based on his best role(s) and give him my personal recommendation rating. Sorry, I don't have one. I used to share shortlists before, but people would steal them and post on other sites without my consent. However, I will release a few shortlists with my favorite players. 50 comments have been posted so far. Revised ST for 19.3. That revision concludes the updating process of this list for the winter data changes. Enjoy! @ChloeLouCaine - not all these players will be loaded into your game DB, it will depend on what leagues you run, what size db you have etc. Hope that helps. @Stam HI, when we can expect a list of AML, AMR, AMC and ST. Great list, I have been using it since 2018. Idrissa Doumbia is listed as a Croat. Great stuff btw! Revised DM for 19.3. Hopefully I can finish MC tomorrow. Thanks for the massive work ! As promised, I've revised D/WB L for 19.3 as well as D/WB R for 19.3 today. @DemonSoul: I'll never offer a downloadable shortlist of the entire list. But I like your idea of doing one for the cream of the crop. Can't promise when exactly, but I intend to prepare it after I'm done with the 19.3 revisions. I would love a shortlist that i could download, is it possible? Revised DC for 19.3. Sorry I couldn't finish this sooner. For tomorrow, the plan is to revise full backs (both left and right). Revised GK for 19.3. New entries marked with the 19.3 tag. Next revision to arrive tomorrow. Apologies for the delay guys. Been sidetracked last couple of days and couldn't even complete my initial 19.3 revision. Will definitely finish it tomorrow though. @Aliefc: Not all the updated players. Only those who will make an entry to the list after 19.3 and didn't exist before. Quick Update: I've started working on the 19.3 revisions. You can expect first revision to arrive during the weekend, and then will be doing at least one position per day until the entire list is complete. THANKS for over 1.85 million views so far, it's much appreciated! @Hippemann: I honestly can't remember. I only remember doing a cut-out of it from some weird picture I found. It was quite a few years ago. This very baby has become a trademark for my wonderkid articles. Hey that might be a weird question but i was wondering where did you find the image of the baby doing an overhead kick. @arsenalthebest: I didn't load all leagues, in fact I just loaded one. What I did was to load all players in the database. You can do that by going into advanced database size settings and ticking "players of nationality" in all continents. Marcel Ruiz is not English. @denik: Minchev is -75 PA (120-150 random range). That means there's a very slight chance he will get wonderkid status in a save. His average PA would be 135 though, therefore he can't qualify for my list. FYI, there are 9 Bulgarians Under-21 with the same potential ability as Minchev. Handcrafted in Symi, Hellas. Page created in 0.636 seconds.